Galvanic series for various conducting materials in seawater (water velocity 2.4 to 4 m/s, immersion time : 5 to 15 days, temperature : 5 to 30°C), from ASTM G82. The potential is expressed with respect to a saturated calomel reference electrode. 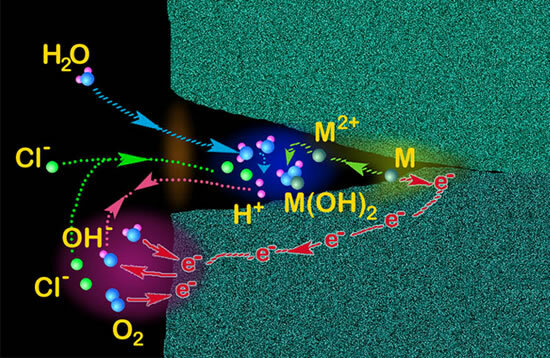 The blue cells indicate the potentials in the active state for passivatable metals. 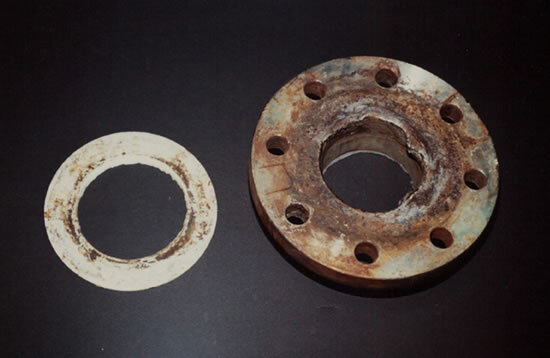 Galvanic corrosion can be defined simply as being the effect resulting from contact between two different metals or alloys in a conducting corrosive environment. Another term employed is galvanic coupling. When a metal is immersed in any electrolytic solution, it is possible to measure its dissolution (natural corrosion). For each solution, it is possible to establish a "galvanic series", that is, a ranking of different metals and alloys as a function of this measured potential. When two different metals or alloys immersed in the same solution are joined together electrically, an electric current will be set up between them, resulting from the short circuit created. 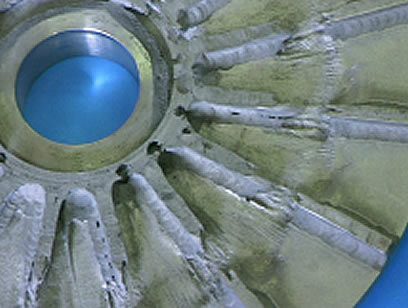 The coupling potential must of necessity lie between the two potentials for the uncoupled metals and an increase in corrosion is generally observed in the less noble alloy and a decrease or suppression of corrosion in the more noble material. Due to modifications in the electrolyte, inversions may occur in the potential series. Thus, zinc covered with corrosion products can become more "noble" than iron in certain hot waters (problem encountered in domestic hot water tanks); tin can become less "noble" than iron in organic acid solutions (problem encountered in food cans). For a given current between two different metals, the current density, and hence the rate of dissolution of the less noble metal (anode,) will be greater the smaller the surface area SA of the anode. The use of unfavourable surface area ratios has led to many expensive and often spectacular failures.